3 Leading UCaaS Providers: Which Has the Edge? As Mitel shares in this sponsored post, IT decision makers can benefit from Tolly’s head-to-head analysis of seven critical factors. Cloud-based business phone systems and unified communications as a service (UCaaS) are expected to continue double-digit CAGR for years to come. Increasing demand from enterprise and SMB buyers reflects cloud communications drivers like low cost of operation, single platform integration, BYOD mobility, and 24-7-365 service support. But voice-centric services are what dominate market share and buyer attention. Providers have responded, and yesterday's feature-rich telephony product specs are often table stakes today. If your organization is in the market for a UCaaS solution, you'll want to undertake a close analysis of provider product details -- doing so can be time-consuming, but will yield critical points of differentiation. If your organization is seeking a new cloud phone and UC solution, you're most likely looking to simplify your communications management and responsibilities. You may have on-site systems and want to reduce time spent managing and maintaining your solutions. Or you may have inconsistent patchworks of cloud-based solutions -- potentially including prosumer and freeware communications applications -- that can vary in performance and open network security risks for your entire organization. Like many other organizations, your company may be under budget constraints and challenged to do a lot with a little. Getting the most performance for money spent is critical, especially when investing in an application as fundamental to business productivity as business communications. 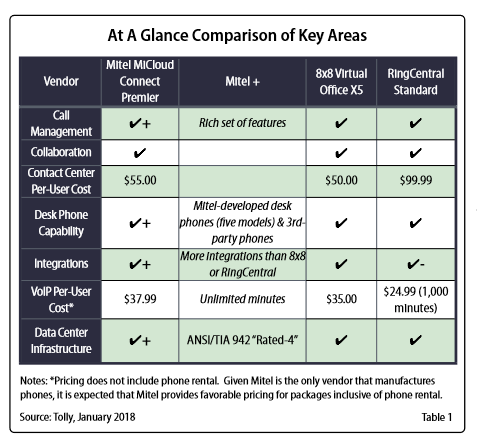 To assist IT decision makers in finding the right UCaaS vendor for their organizations, Mitel recent commissioned The Tolly Group to examine the feature sets of three leading SMB-class cloud communications solutions: Mitel MiCloud Connect Premier, 8x8 Virtual Office X5, and RingCentral Standard. It also assessed each provider's collaboration and contact center components, to render the most comprehensive measure of performance. Want to learn more about Mitel? Click here or reach out to us directly at 844-257-5318.